In this post we are sharing you a very good book for English Vocabulary. 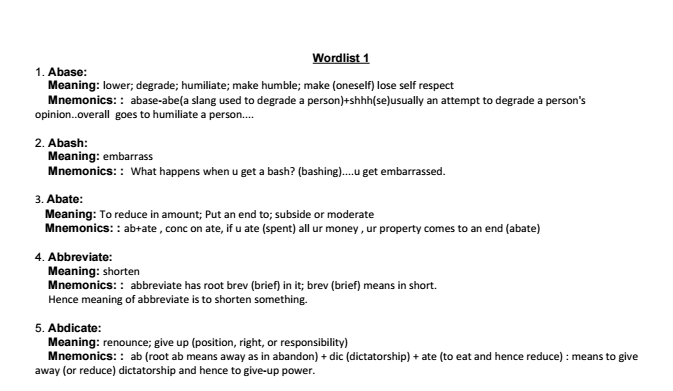 This book contains Barron's wordlist with mnemonics which makes it very easy to remember words for long term. This small trick book is very helpful for many competitive exams as well as for self improvement. You May download this book from the link provided below. Keep visting, keep learning, have a good day. Disclaimer: Qmaths neither created these files nor uploaded, We shared link which is already available on Internet, if anyone has any objection then kindly mail @ qmaths.in@gmail.com to request removal of the link.